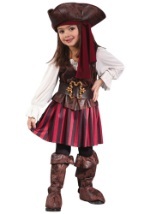 This adorable and authentic girl's Brave Buccaneer costume will have your little girl looking like a tough, tomboy pirate! The dress is made out of polyester and has ivory colored sleeves. 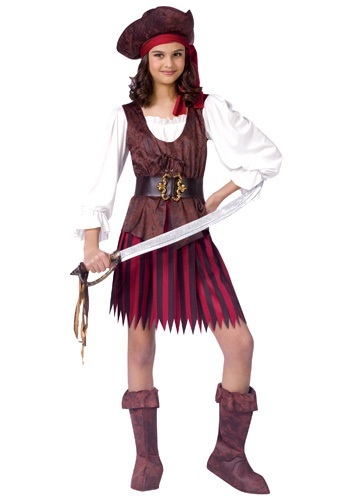 The elastic waistband in the dress pulls it together in the middle and the striped red and black skirt makes the outfit look even more like an authentic pirate. 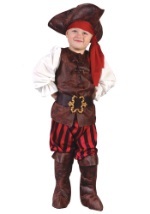 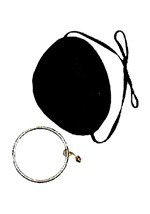 The polyester pirate hat and boot tops both have a distressed look to them which makes them appear like leather. 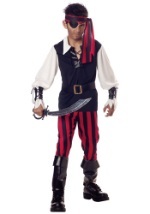 Tying the entire costume together is the included dark red bandana. 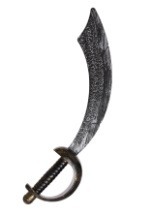 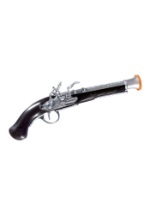 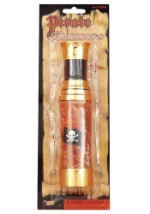 Don’t forget to check out our great accessories, like toy swords, to make your costume even more realistic!